The Optics + Optoelectronics Conference 2019, organized by SPIE (The international society for optics and photonics), has become an internationally reputable platform for sharing important research and the latest advancements to help move research and technology into the future. Conference was organized at Prague Congress Hotel Clarion within April 1-4, 2019. The researchers from IPE chaired 4 conferences and organized a specialized workshop including excursion to the laboratories (photogallery). Over 900 people attend this highly regarded conference on the latest advances in laser technologies covered in 800 presentations. Program included also workshops, discussions and laboratory tours. One of the points of the busy schedule was Optical Fiber Technology Workshop, series of tutorial and invited lectures oraganized by our intstitute, followed by excursion to optical fiber laboratories, where visitors could see the preparation of so-called preform and then optical fiber drawing. 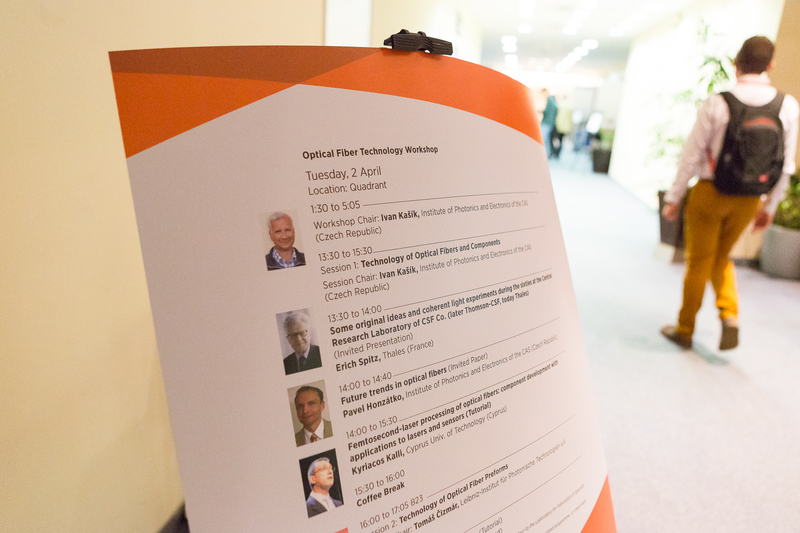 The Optical Fiber Technology Workshop was focused on advanced fabrication methods of optical fibers and optical fiber components. The workshop and excursions were organized together with commemoration of 40 years of optical fiber technology research in Czechia (press release - in Czech only). Distinguished guests of the symposium were Gerard Mourou, Nobel Laureate of Physics 2018, and Erich Spitz from the French Academy of Sciences, originally Czech scientist, honorary chairman of the symposium and author of the first single-mode optical fiber for transmission of information. Mr. Erich Spitz accepted our invitation to visit IPE (photogallery). Photogallery from SPIE Optics + Optoelectronics 2019 (incl. workshop and lab tour) here.